Chrome 12" Skirt/Pant Hanger with loop top. (box of 100). 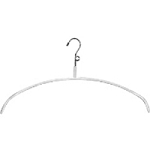 Home > Hangers > Salesman Hangers > Chrome 12" Skirt/Pant Hanger with loop top. (box of 100). Chrome 12" Skirt/Pant Hanger with loop top. (box of 100). Sturdy unbreakable steel hanger, excellent for salesmen, showrooms or other professional users. Used for skirts. Has two (2) chrome-plated clips.